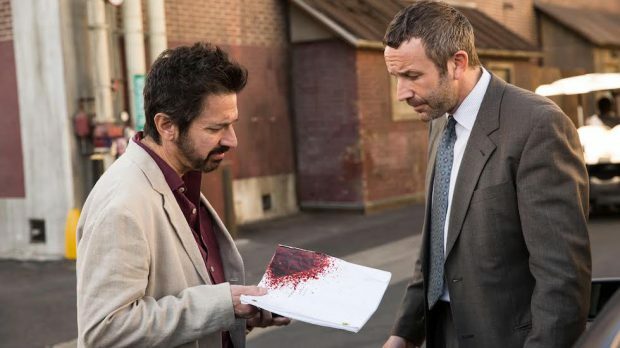 When a phenomenal script falls into his lap, film buff Miles (Chris O’Dowd) sees his way out from a life of crime. A way out through Hollywood, that would allow him to tell his daughter truthfully what he does, and perhaps even reconcile him with his wife. With the means in hand all he needs to do, is to convince his crime boss (wonderfully underplayed by Lidia Porto) that investing in a film is a good way to launder ill-gotten gains, and a washed up b-grade director (Ray Romano) that a period piece is a hot property for his next film. The question becomes, which is the more cut-throat – a multi-million dollar studio system, or a group of Nevada mobsters, that will literally cut throats? Although not a million miles away from the cool, slick 90s film of the same tittle, this series turns the same source material into something darker, grittier, and still marvelously humorous. Miles is more of a grinder than “Chili”, suave in his own way, but certainly lacking that aura of invincibility that gave Travolta’s character such swagger. By contrast O’Dowd is someone that has to struggle and claw for what he wants, and the character certainly takes his licks upon the way. Get Shorty is a less cartoonish take on the criminal underbelly at the heart of Elmore Leonard’s novel, and the Nevada dust is not the only thing that adds a layer of grime to the proceedings. From small town street slingers to big studio Hollywood execs, this lifts the hood off to allow audiences to see how business is done, and it’s certainly a full contact sport (even before gangsters get involved). Yet this is also a series that knows how to exploit the humour in this situation, black though it may be. The cast certainly has a sense of comedic timing vital to the gallows humour scattered throughout – be that Romano’s pause when he realises once again that he is over his head in a situation that is more dangerous than he previously imagined, O’Dowd’s charming grifting, or Sean Bridges’ mater of fact execution of crimes (while being neurotic about almost every other facet of his life). That balance between the violence of the criminal underworld, the cut throat industry of Hollywood, and the audience’s empathy with the engaging array of characters is what makes this version of Get Shorty a far richer creation. Driven by frequent long-tracking shots that keeps you close to the action, and a frenetic score by Antonio Sanchez (responsible for those unforgettable drums in Birdman) it’s a series that organically builds in complexity and danger, as the whole house of cards that Miles sets up grows closer and closer to toppling over with each corresponding move. All of which makes for compelling viewing.